No need to eat your cucumber in its raw version anymore. 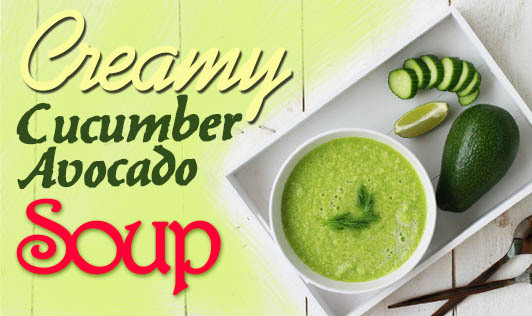 Try this silky-smooth delicious soup made with cucumber and avocado. It is rich in fiber and good fat. • Heat oil in a large nonstick pan on medium to high heat. Sauté garlic and onion until tender for about 5 minutes. Add lemon juice and cook for a minute. • Now add 4 cups of cucumber slices, vegetable stock, salt and pepper, and chili flakes and bring it to simmer. Lower the flame and continue cooking until the cucumbers turn soft. Switch off the gas once the cucumbers are cooked well and let it cool. • Once cooled, transfer the cucumbers to a blender; add avocado and parsley, and blend until smooth. • Pour the soup into a serving bowl, add yoghurt, and mix well. • Refrigerate for up to 4 hours. • Garnish with parsley and serve the soup chilled or warm and serve if desired.